Two Dollar Radio, 9781937512347, 208pp. "To the short list of genuinely great addiction memoirs we can now add Sirens, a searing and at times hilarious account of Mohr's lost years in the dive bars and gutters of San Francisco. Like Mary Karr and Jerry Stahl, there is no line Mohr won't cross, either in his erstwhile quest for self-immolation, or his fearless honesty in reporting back from that time. But what sets this book apart is Mohr's unwillingness to traffic in pat notions of redemption." --Ron Currie, Jr.
Acclaimed novelist Joshua Mohr provides a captivating and complicated account of his years of substance abuse and culpability in his non-fiction debut. Employing the characterization and chimerical prose for which he has been lauded, Mohr traces his childhood swilling fuzzy navels as a latch-key kid, through his first failed marriage, parenthood, heart-surgery, and his everyday struggle against relapse. 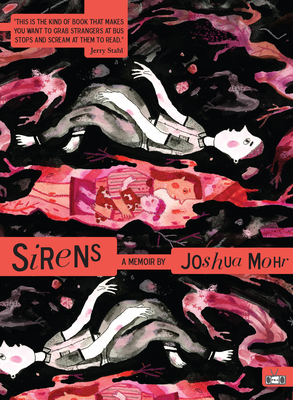 Joshua Mohr is the author of Some Things that Meant the World to Me, one of Oprah Magazine's Top 10 reads of 2009 and a San Francisco Chronicle bestseller; Termite Parade, an Editors' Choice pick at the New York Times Book Review; Damascus, called "Beat-poet cool" by the New York Times; and, most recently, Fight Song and All This Life. He recently moved with his family to Seattle, Washington. JOSHUA MOHR is the author of Some Things that Meant the World to Me, one of Oprah Magazine's Top 10 reads of 2009 and a San Francisco Chronicle best-seller, Termite Parade, an Editors' Choice on The New York Times Best Seller List, Damascus, called "Beat-poet cool" by The New York Times, and, most recently Fight Song and All This Life, which received a boxed review at Publishers Weekly. He recently moved with his family to Seattle, Washington.